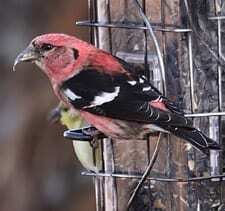 A stocky finch of mature coniferous forests, the Red Crossbill is dependent on the seed cones that are its main food. Its peculiar bill allows it access to the seeds, and it will breed whenever it finds areas with an abundance of cones. It may wander widely between years to find a good cone crop.